Believe it or not, the regular season has officially come to an end for the 2018 NFL season, which means the checkered flag has been waved in our season-long race for PFF’s Rookie of the Year award. It was a close race all season long, with a handful of candidates battling it out at the top over the final few weeks and close to 40 total rookies hovering within range of cracking our top-25. Last season we saw Tre’Davious White, a cornerback for the Buffalo Bills take home Rookie of the Year honors but this season our winner comes from the offensive side of the ball. Thank you to everyone who has followed this race along throughout the season! Watching this race unfold and diving into how rookies are acclimating into the NFL is one of my favorite things I get to do here at PFF and none of it would be possible without you, the reader. Without further ado – except for this quick second where I wish you all a tremendous 2019 – below are the top 25 rookies of the 2018 NFL season. Lindsay finishes the season ranked 11th out of 68 half backs who saw at least 200 offensive snaps in terms of PFF overall grade, and his 84.1 rushing grade ranked seventh. Lindsay was one of the most consistent backs all season long when it came to making big plays in the running game, out of the 28 half backs who carried the ball at least 150 times this season he ranked second with 15.6% of his handoffs going for at least 10 yards. Largely as a result of those big plays, Lindsay ranked fourth among that group by picking up either a first down or touchdown on 25.0% of his carries. 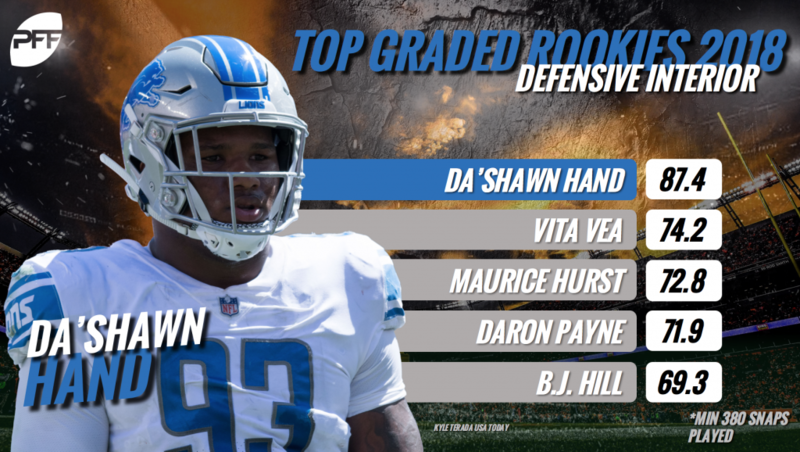 Hand ranked 13th among qualifying interior defenders this season in terms of overall PFF grade, and he was a model of consistency on Detroit’s defensive line, finishing 9 of 12 games this season with an overall grade of at least 70.0 (excluding Week 14 against the Arizona Cardinals when he left the game injured after seven snaps). The big man out of ‘Bama was one of just nine interior defenders to record at least 15 run stops without missing a tackle in run defense this season and he ranked 22nd with a 10.1 pressure percentage as a pass rusher. Ward finished the season ranked 14th among cornerbacks in 2018 and he finished eighth among that group with an 83.6 coverage grade. The fourth overall pick ranked 16th out of 84 corners who were targeted at least 50 times this season with an average of just 0.88 yards surrendered per coverage snap and opposing quarterbacks had just a 70.7 passer rating when targeting him in coverage, the sixth-lowest allowed by that group.